Ten activists from Belgian group Vredesactie held a visible picket Friday outside the offices of the Ministry of Economy in the Brussels and held a lobby meeting with ministry officials as part of Take Apartheid off the Menu action day. The short conversation focused on the responsibility of the ministry to prevent settlement produce from entering the market in Belgium, and the activists handed over samples of settlement produce and a briefing document emphasising the role settlement products play in facilitating settler attacks on Palestinians in occupied Palestinian territory. 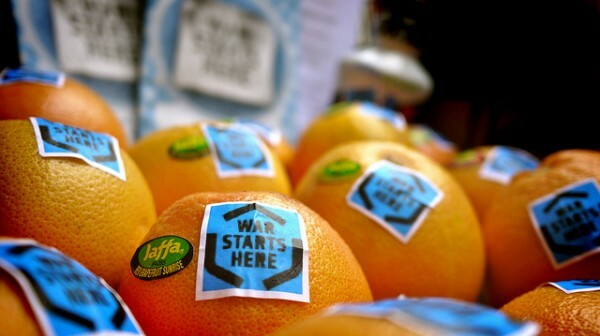 The activists held a huge banner that read 'War Starts Here' and succeeded in securing media coverage for the action.